In fact, I ended up doing most of the work on these because by the time Zach perfected his margarita recipe, I was already putting the food in the oven! Preheat oven to 375*. Spray a large rimmed cookie sheet with non-stick spray. Put all of the veggies in a bowl, drizzle with olive oil, and add the spices to suit your tastes. I use a few shakes of chili powder, a little less cumin, and one shake of chipotle powder and garlic powder. Sprinkle with salt and pepper and toss it all together. Spread it out evenly on the prepared cookie sheet and roast in the oven for about 10 minutes. 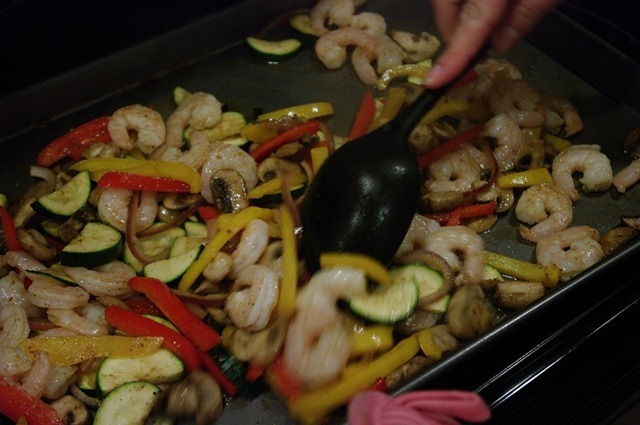 Meanwhile, toss the shrimp with olive oil and the same spices you used for the veggies. 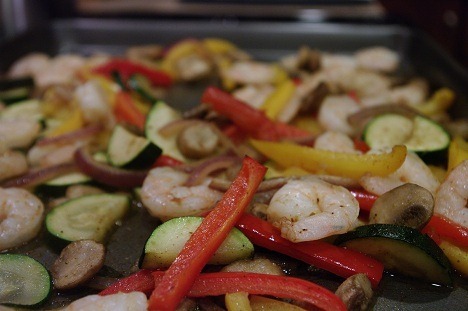 When the veggies come out of the oven, stir and then add the shrimp, spreading them out so they don’t overlap. Put it all back in the oven for 8 to 10 more minutes, stirring once half-way through. Transfer it all to a serving bowl and enjoy! We served them with small tortillas, vegetarian refried beans, and chips and salsa. A note on chips and salsa (one of my loves!). 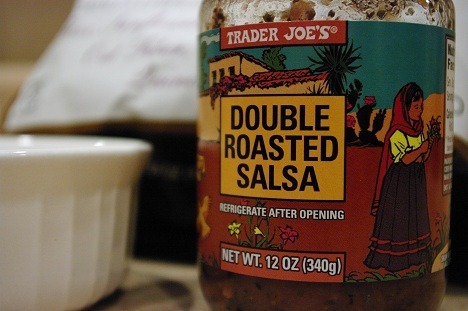 My favorite chips are Food Should Taste Good Multigrain chips, which Costco FINALLY started carrying again and my favorite salsa is Trader Joe’s Double Roasted. We don’t have TJ’s here (the horror! ), so I smuggled this back from my last trip to St. Louis. I consider myself a generally social person. I like to spend time with my husband, my friends, my family, I like to work with others, and I get energy from talking with others. But sometimes, I just need some time to myself. Early in our dating days, I explained this to Zach and made sure he knew when I wanted to spend time by myself, it wasn’t something he should be offended by. It’s not that I don’t want to spend time with him, it’s just that for my sanity, I need to spend some time with no one. Sometimes that time can be my workout, or reading a book, or cooking, but one of my favorite things to do is spend some quality time shopping by myself. I can aimlessly wander or go on a mission for the best pair of black pants in Omaha. I don’t have to explain what store I want to go to next – or go back to for the third time – or why I’m staring at the same display of candles at Bath & Body Works even though I know I won’t end up buying one. So yesterday afternoon, I took off for a couple hours of shopping by myself. I only went to one mall and didn’t really do anything weird, but something about it is just really relaxing to me. I wandered around The Limited, tried on a bunch of stuff, stared at the jewelry, and got some great deals. At one point I ended up in Dillard’s where they were having a shoe clearance and I tried on almost every pair on the clearance rack in my size (and then got 2 cute pairs for $40 total!). After I hit a few stores, I knew I was done purchasing, but I just wasn’t quite done shopping ( I think this is a distinction that only women will get). I got a tall Passion Fruit Iced Tea from Starbucks and then continued on what can only be called aimless wandering. Eventually those shoes in my bag got a little heavy and I decided to call it good. So I headed home, relaxed and refreshed with some new clothes and shoes to show for it and ready to spend an evening with my favorite person! Do you like to spend time by yourself or do you prefer to always be with others? What about shopping – alone or with a friend? On Saturday I ran 5 miles! This is the farthest I have run since taking a break from running to let a strain in my hamstring heal last fall. It felt awesome! I did the run on the treadmill since the weather was iffy and I think we still need a little more melting action on the sidewalks/trails. On Sunday in yoga I finally jumped from crow to plank! I got the hang of crow about a month ago ( it’s still really the only arm balance I have mastered), but I just couldn’t seem to get my legs off my arms and into plank. I was at a class with a teacher I have never had before and some of her cues helped me out. The key for me is taking my gaze forward, which shifts the weight forward a bit and then it’s all core to get the legs back. I felt so STRONG. Other activities last weekend included seeing the Oscar-nominated animated short films at Filmstreams, dinner at a new pizzeria with Zach, and having my sister and her family over for dinner – what a great weekend! So when I signed up for a May 2nd half-marathon a few weeks ago, I told myself I had until March to start running outside. Well, February was (surprise!) really cold and all that stinkin’ snow didn’t go away, so I wasn’t sure how well it would work out. But then along came March 1 in like a lion with a sunny almost-40-degree day and I found myself layering up and heading out for my first outdoor run of the year. Since taking my dog for walks around the neighborhood involves leaping over some snow banks, I went to a nearby lake path where I had seen people running recently, so I assumed the path was clear of snow and ice. I was about 70% right. The other 30% of the trail was covered in either packed snow, thin ice, slushy mess, or puddles. I did my best to go around those areas and was very very careful. I completed my 4 miles without any incidents and only one slightly damp shoe from a puddle I couldn’t avoid. It was fun in an adventurey sort of way, but I’m not sure I’ll be running outside again until more melting happens. I spent most of my run either scared of falling or scared of stepping in a big puddle and running in a wet, cold sock. Luckily the 10-day forecast is all above freezing so hopefully by next weekend I’ll be ready to head out on a 100% dry run! Today I stopped into my favorite grocery store Hy-Vee for a few necessities: bread, milk, and apples. I grabbed my usual organic skim milk and fuji apples (on sale this week- woohoo!) and headed to the bread aisle. Lucky for me, a few months ago Hy-Vee started including NuVal scores on many of the products in the store (and then later I learned even more about NuVal from Tina!) In a nutshell, NuVal scores calculate the nutritional quality of food items by analyzing the nutrients and breaking it down to one number that consumers can use to make more informed choices. Good stuff goes in the numerator, bad stuff goes in the denominator and the final numbers can be used to compare products to one another. The numbers range from 1 to 100, but not all product categories can get 100. Makes sense to me, I noticed most things in the produce section are in the 90’s, but many of the packaged products don’t get that high. So, back to the bread aisle. I snapped some pics with my phone to remember these scores. 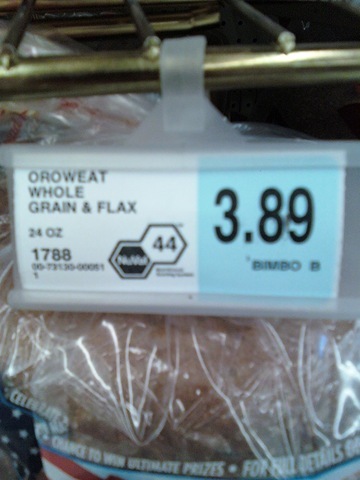 The highest bread score I saw was 44 (although not every bread had a score), which was on Oroweat Whole Grain & Flax bread. 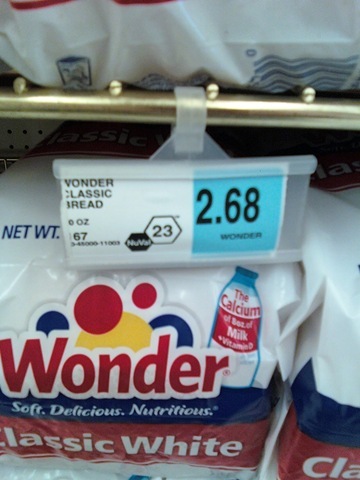 The lowest score I saw was good old white Wonder bread at 23. 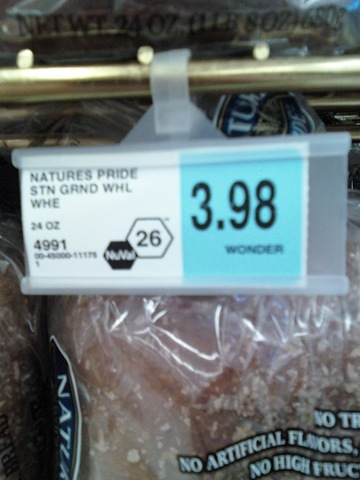 Something I thought was interesting was the middle one above – Nature’s Pride Stone Ground Whole Wheat, which only scored a 26. I thought this was interesting because it met my criteria with whole grains and had all the right things on the front of the package, which you can kind of see: “No Trans Fats, No Artificial Flavors or Colors, and No HFCS.” I’m not exactly sure what drove this score to be lower and am surprised it was closer to the Wonder bread than the Oroweat. It’s something I would have picked up expecting it to be a healthier choice, but with the simple presentation of the NuVal score, I was steered toward a better choice. I haven’t tried it yet, but I hope it’s good! As of yesterday, I am on my way to my third half-marathon: the Lincoln National Guard Half-Marathon in Lincoln, NE on May 2. The two half-marathons I have run before have been VERY different experiences, so I wonder what this one will hold? My first half-marathon was in St. Louis in April 2005, about one month before I graduated college. Running a half-marathon was a goal of mine and something I was determined to accomplish. I had originally set a goal of under 2 hours, but revised that to “around” 2 hours once I started training. Fast-forward four years later to spring of 2009 when I ran the Lincoln Half-Marathon for the first time. My excitement for finally running another half-marathon starting building in January and I mapped out my training plan with precision and focus. My goal: to beat my time from 2005. Should be a cinch because there’s no way I could drink that much or eat that much greasy food in “real life".” This time I was also equipped with gadgets: a heart-rate monitor and a Nike+iPod gadget in my shoe to track my distance on my iPod touch (and the obvious upgrade to MP3 player over radio stations on the Walkman!). I ate healthfully most of the time, slept on a regular schedule and was a generally responsible pseudo-adult. I also worked 40 hours a week and took a graduate class once a week. I stuck to the long-runs on my training plan and most of the speedwork, but was a little loose with cross-training and shorter run days. My knees started bothering me, it was cold outside, and I just wasn’t always into it. I crossed the finish line in 2:01:11 and, although it wasn’t that much slower than my previous time, it just didn’t feel good. Usually running makes me feel strong and powerful, that race made me feel weak, achey, and old. But this year I’m back! I have taken some time off running to let a nagging hamstring strain heal, and added yoga into my workout schedule. I plan to get my miles in, but still have fun and not take myself too seriously this time around…striving for a balance between my last two half-marathon training experiences. Both contain cajun spices and the “holy trinity” of onions, celery, and green peppers. I ended up using this Robin Miller recipe for the Crock Pot since I had yoga class tonight and wanted it to be ready when I got home. 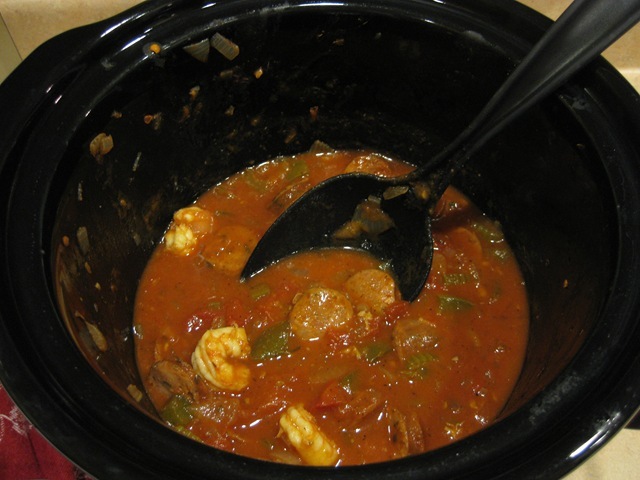 After work I threw all the ingredients in the crock pot; I made a few changes based on what I have on hand so mine contained sausage, shrimp, green peppers, onion, celery, tomatoes and cajun spices. I served it over some Trader Joe’s Wild Rice Medley. We loved it! I’m quite sure it wouldn’t count as jambalaya by the purist’s standards, as it was pretty soupy. Also, traditionally it would have been served over white rice, but we eat whole grains up in here. I have decided to give up sweets for Lent this year, which I guess is ironic since this blog is called Life is So Sweet…but I’m certain that life will still be sweet even if the next 40 days lack chocolate, cookies, and ice cream 🙂 I have a pretty serious sweet tooth, so I will be blogging how it goes. For the past few years, I have given up a bad habit for Lent, like gossiping or complaining, but I feel like this year I really need to get “back to basics” with something that will be on my mind more. I’m off for a last hurrah with some Ben & Jerry’s…happy Mardi Gras! Enjoying the sweet things in life! Enjoying the sweet things in life...cooking, running, yoga, friends, family, puppies, books, sunshine, and whatever else comes my way!